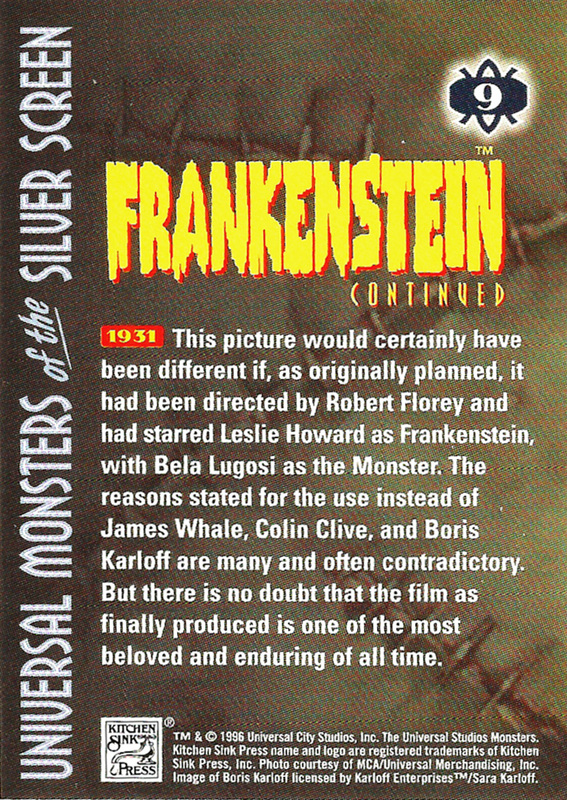 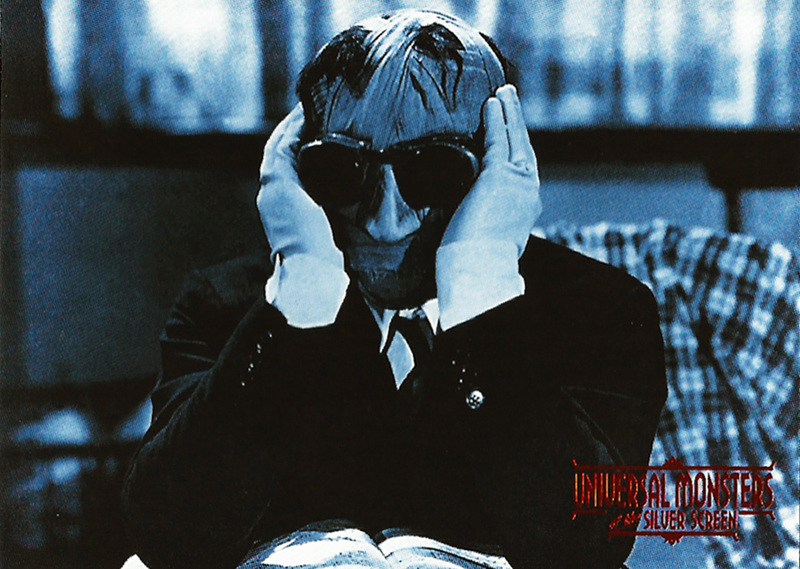 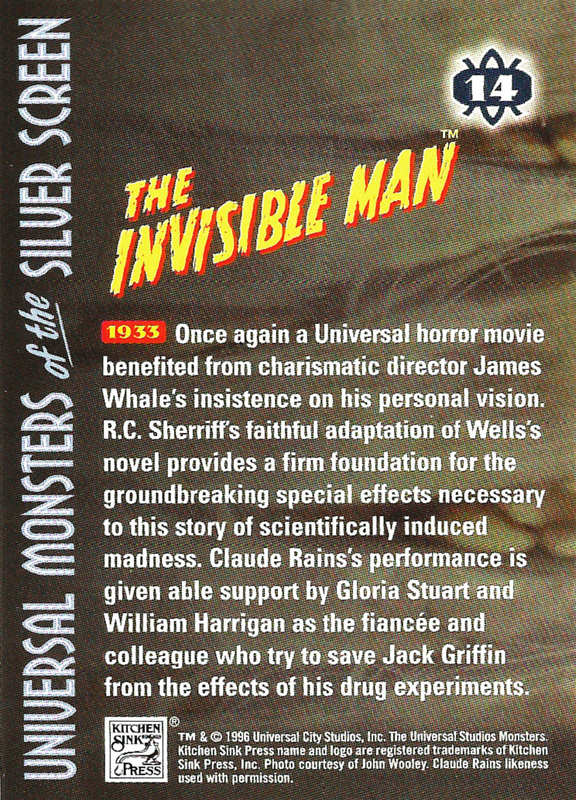 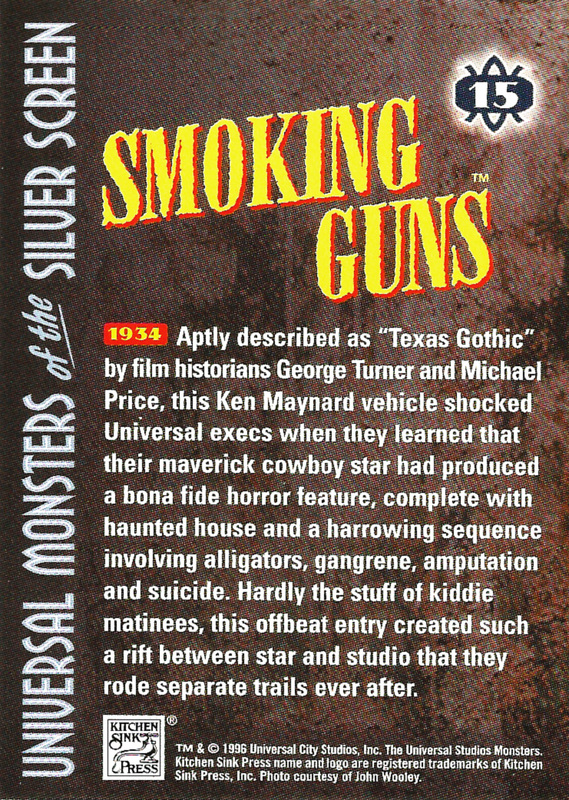 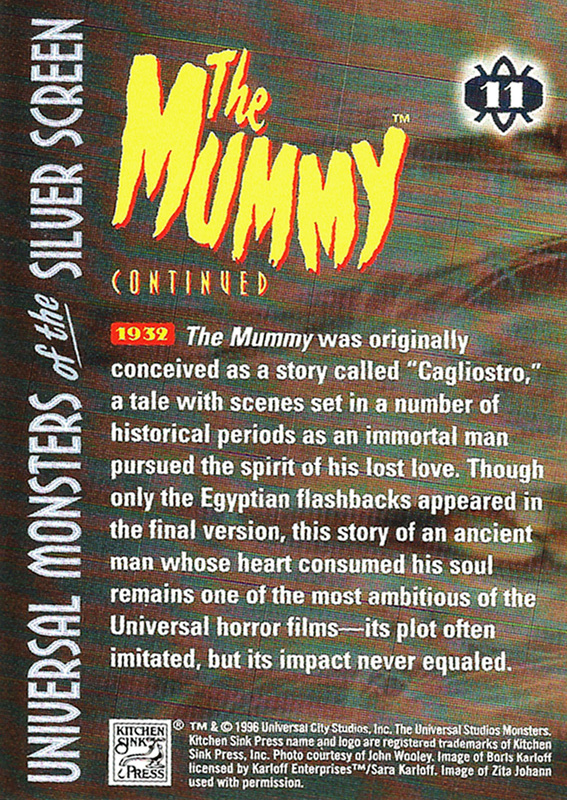 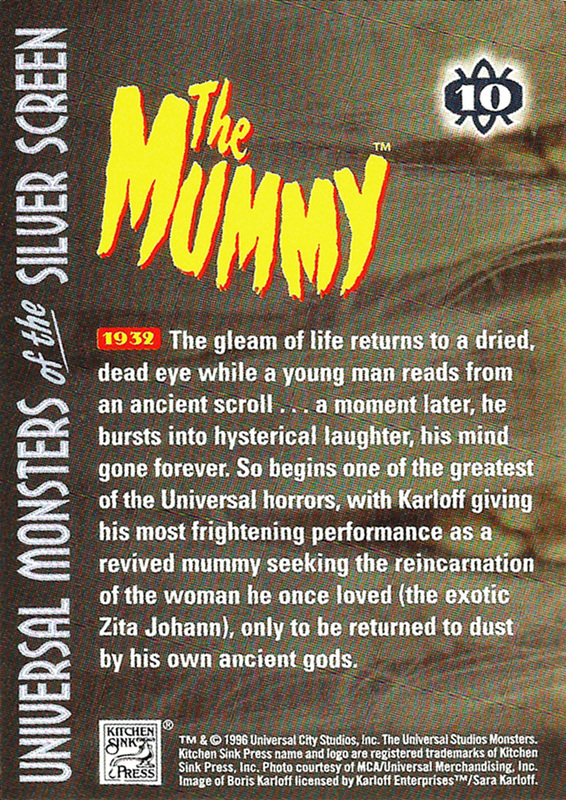 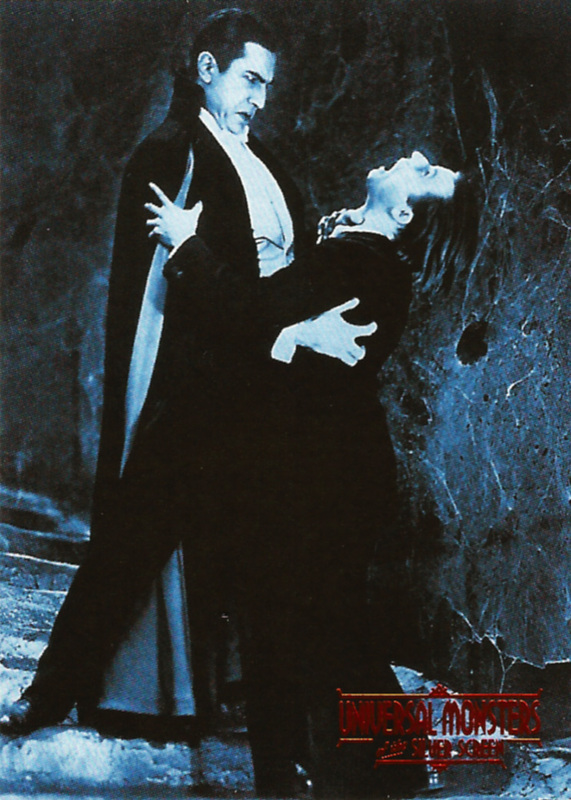 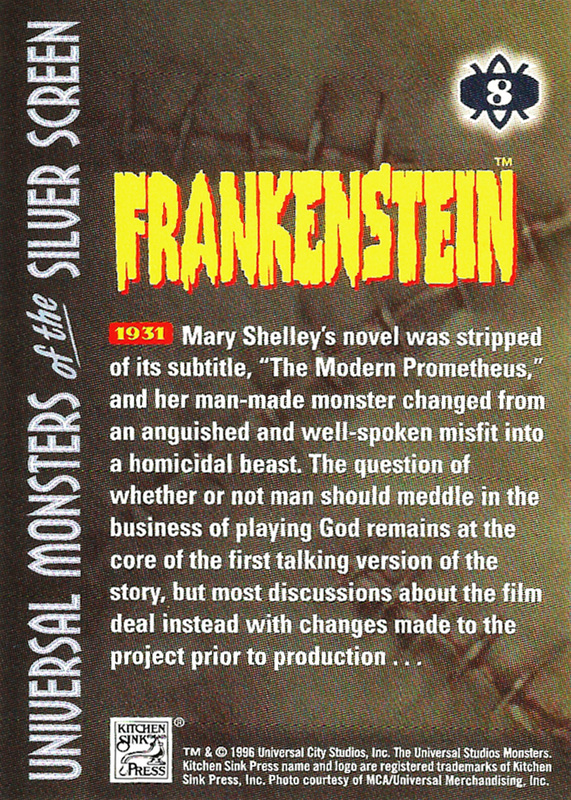 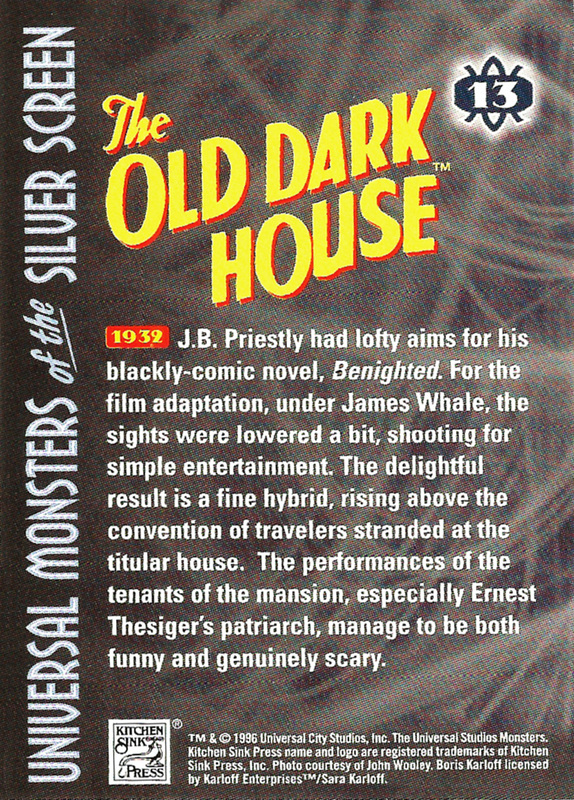 Universal Monsters of the Silver Screen Trading Cards, #1–15 (1996) | 'TAIN'T THE MEAT… IT'S THE HUMANITY! 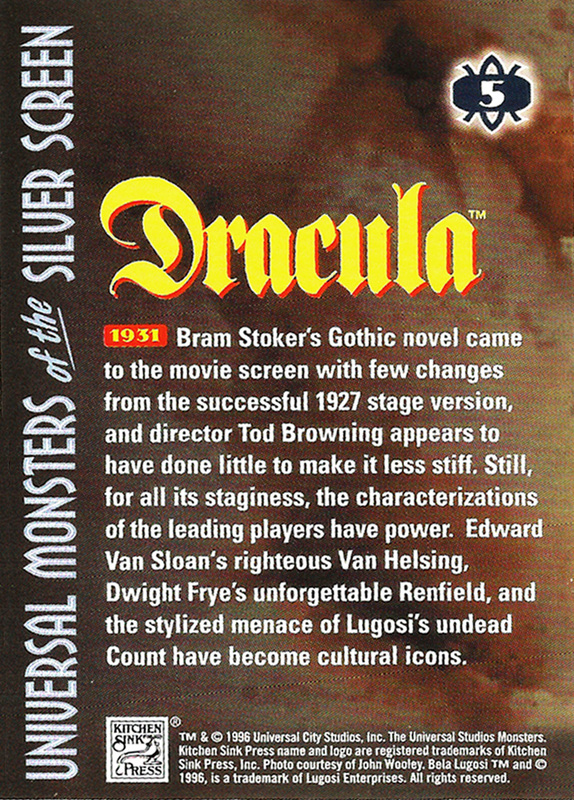 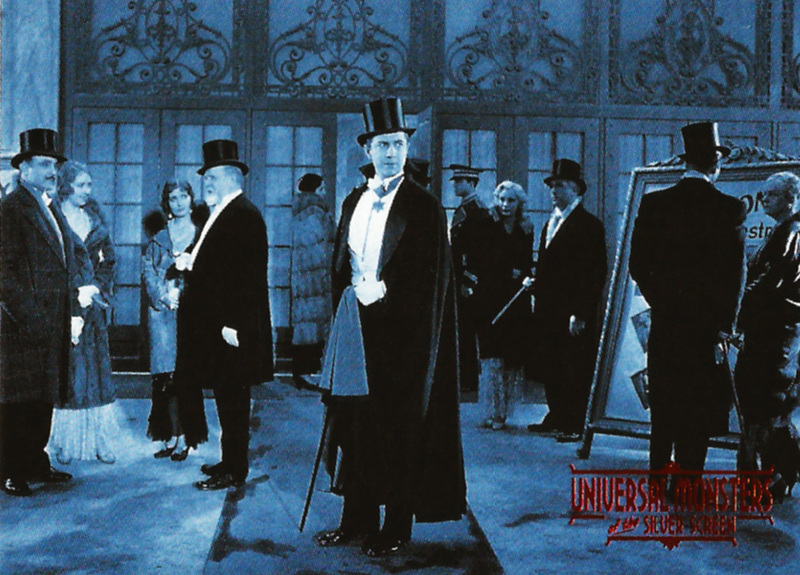 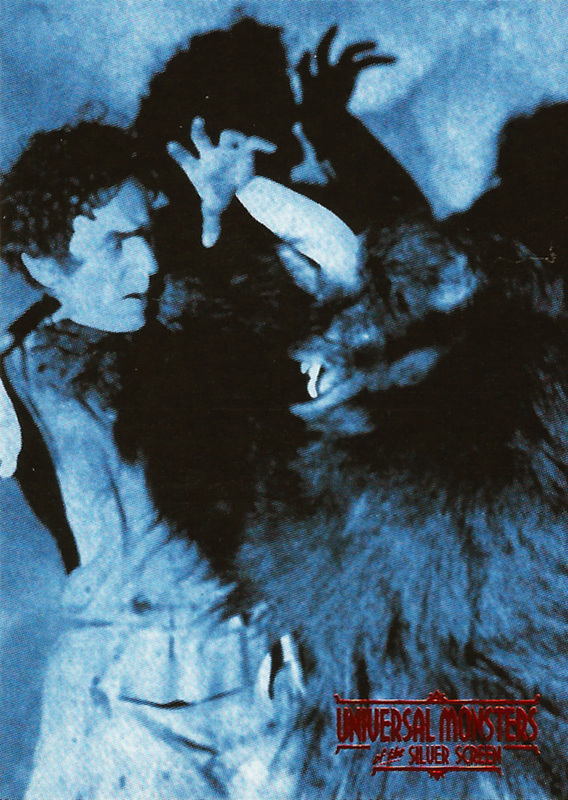 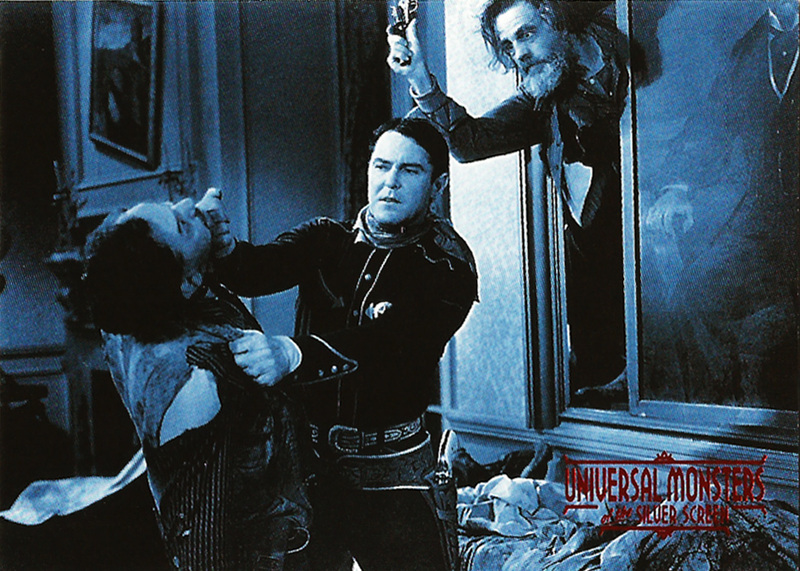 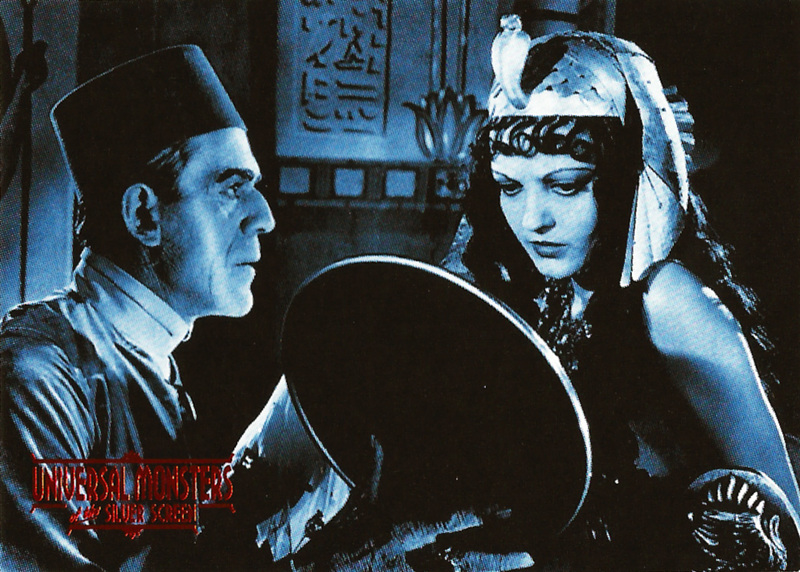 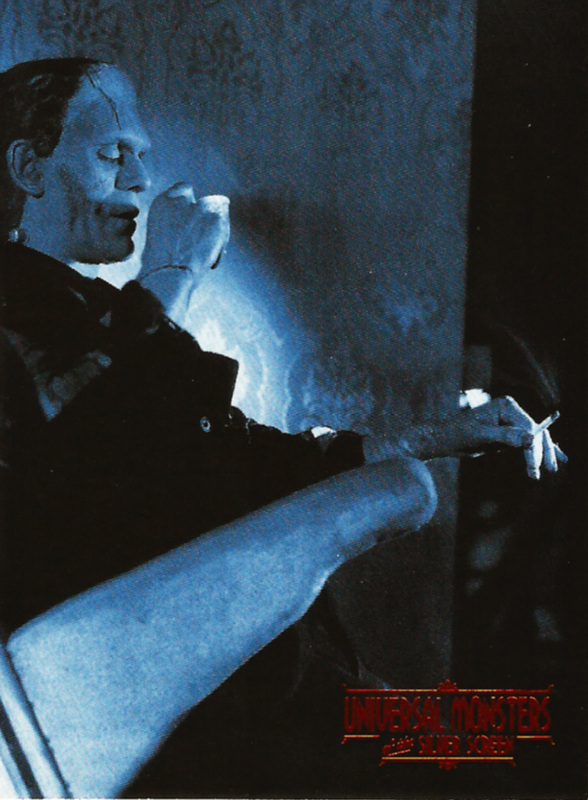 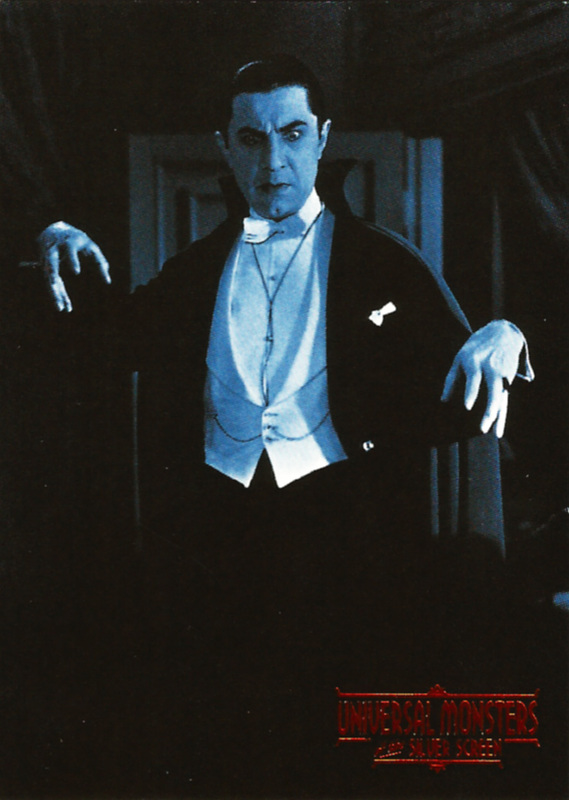 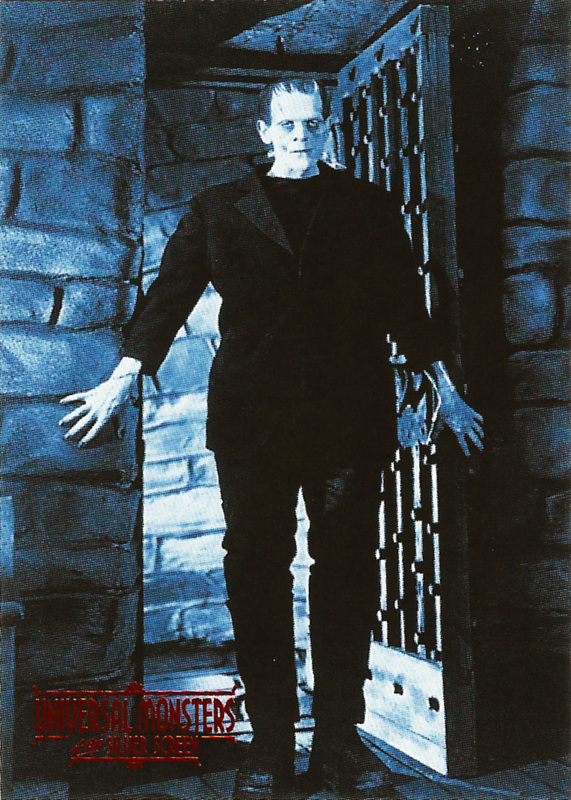 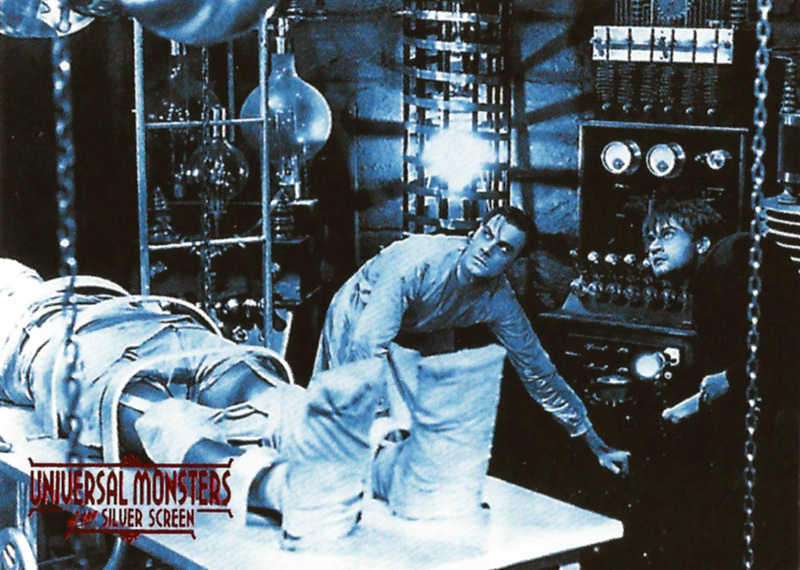 Universal Monsters of the Silver Screen Trading Cards were released by Kitchen Sink Press in 1996 and paid homage to some of Hollywood’s most enduring horror and science fiction films. 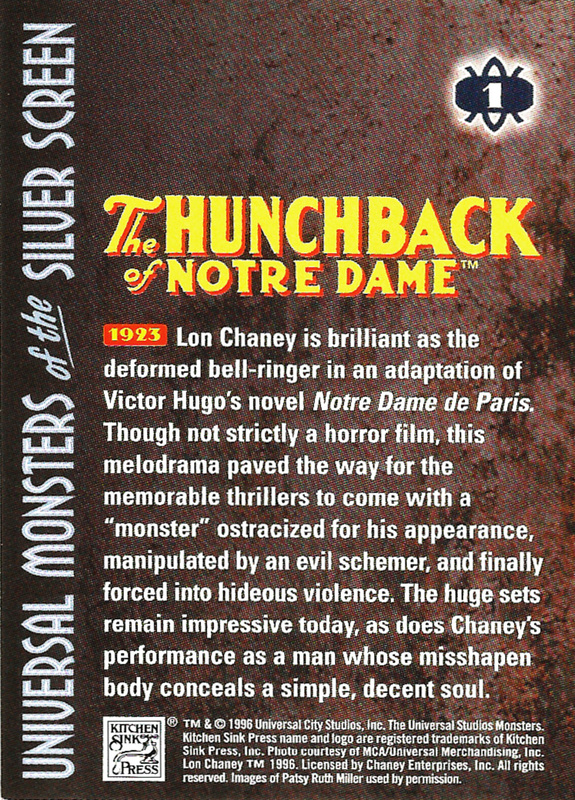 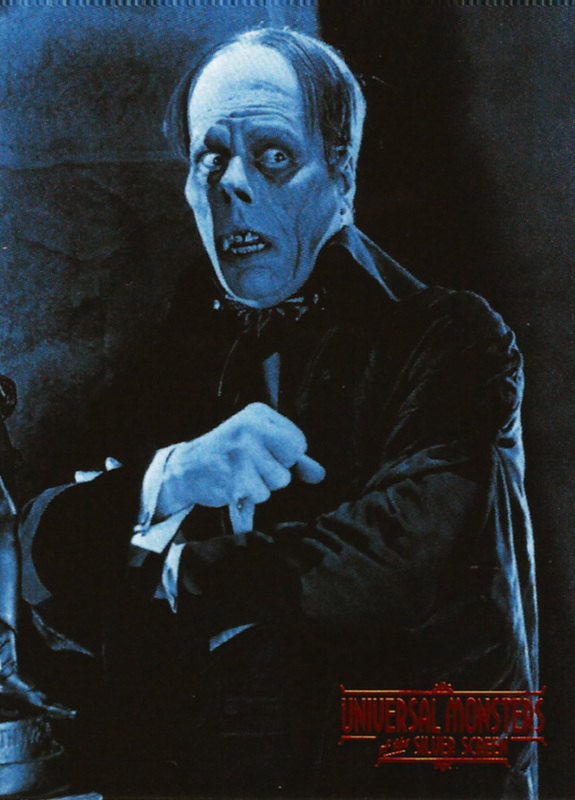 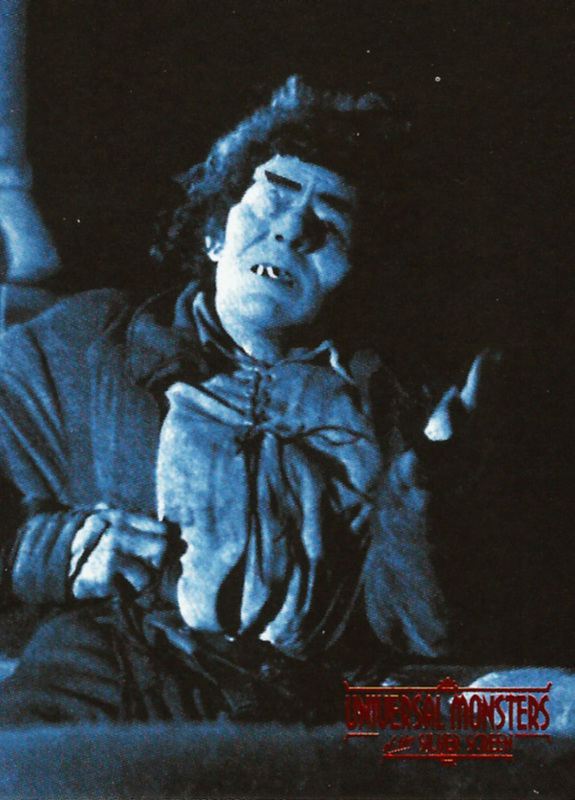 Over a thirty year period beginning with The Hunchback of Notre Dame in 1923 Universal Pictures released dozens of films that helped shape and define the horror genre – movies including Dracula (1931), Frankenstein (1931), The Mummy (1932) and The Wolf Man (1941). 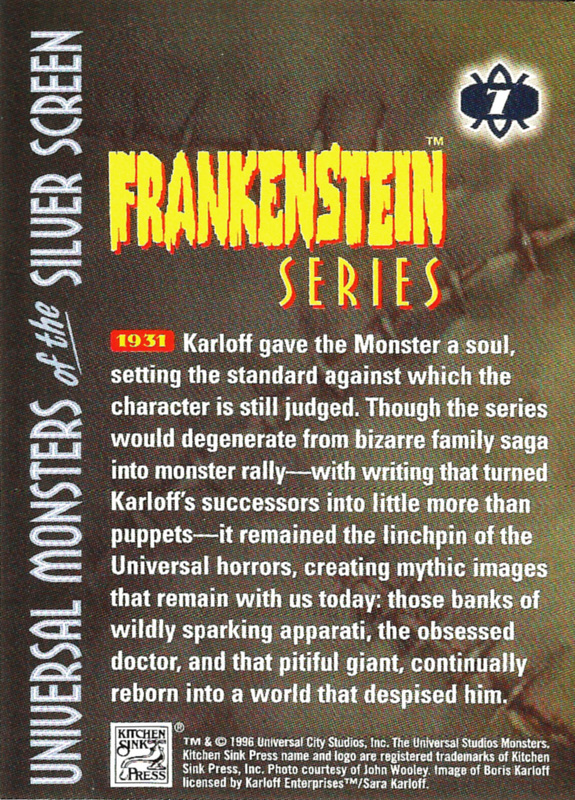 Today many of their films are rightly considered classics and this collection of trading cards pays tribute to the studio who gave us some of horror’s most enduring monsters. 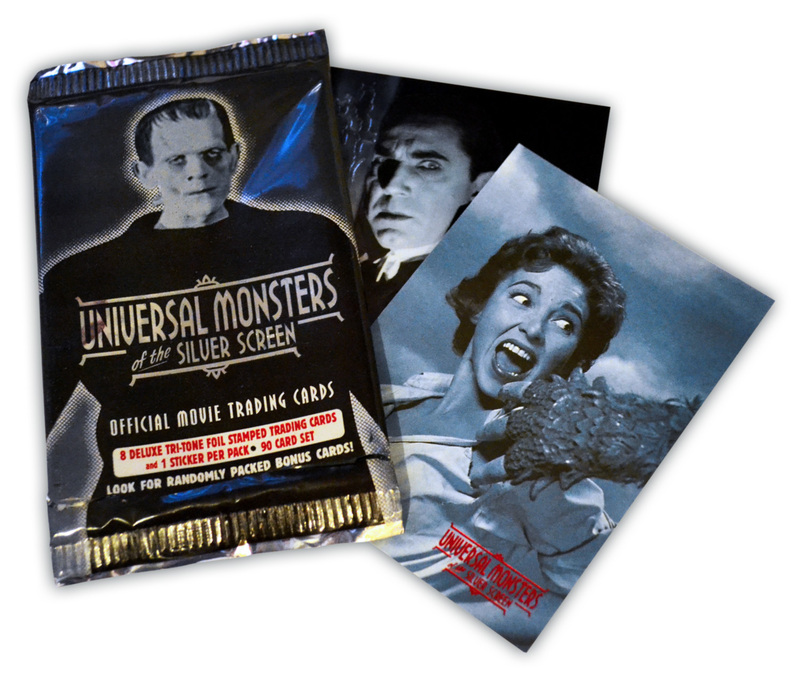 Universal Monsters of the Silver Screen Trading Cards consisted of 90 base cards featuring iconic scenes from over 70 Universal films. 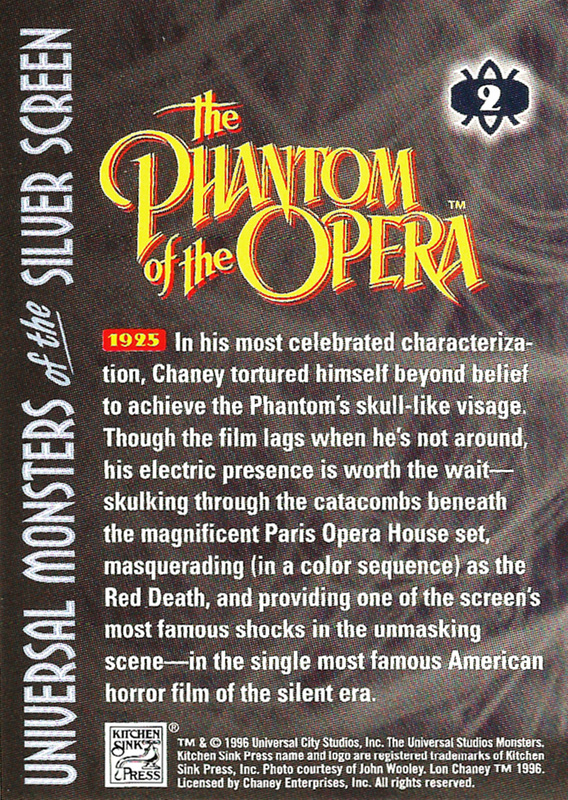 The set also included 10 lobby poster stickers, 12 chromium chase cards (1:9 packs) and one ultra-rare chase card (1:432 packs). 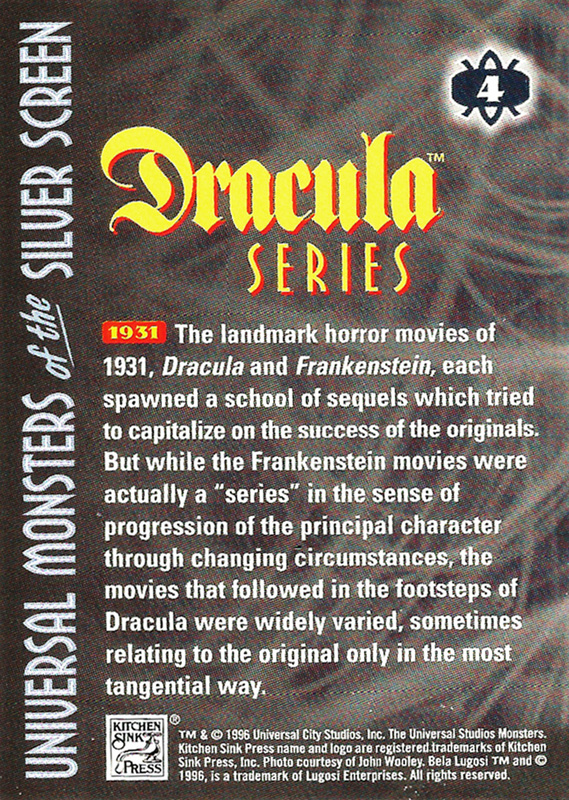 Each card measured 2.5 x 3.5 inches and was printed on thick card stock and each foil printed pack shipped with eight cards and one sticker. 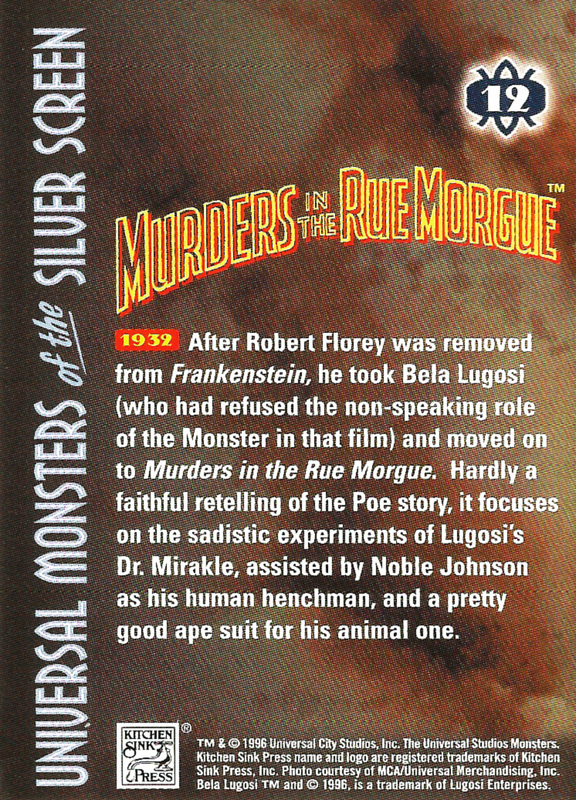 The base cards feature a blue tinted photo (with red foil stamping) on one side and all the cards feature a short, yet informative caption on their reverse. 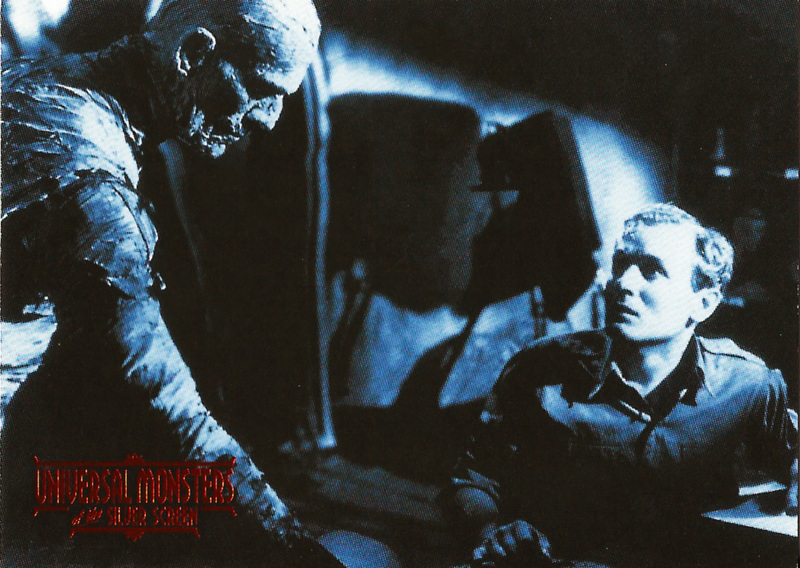 Over the next few weeks I’ll be taking a closer look at the entire set as well as the film’s themselves and the monsters they introduced. 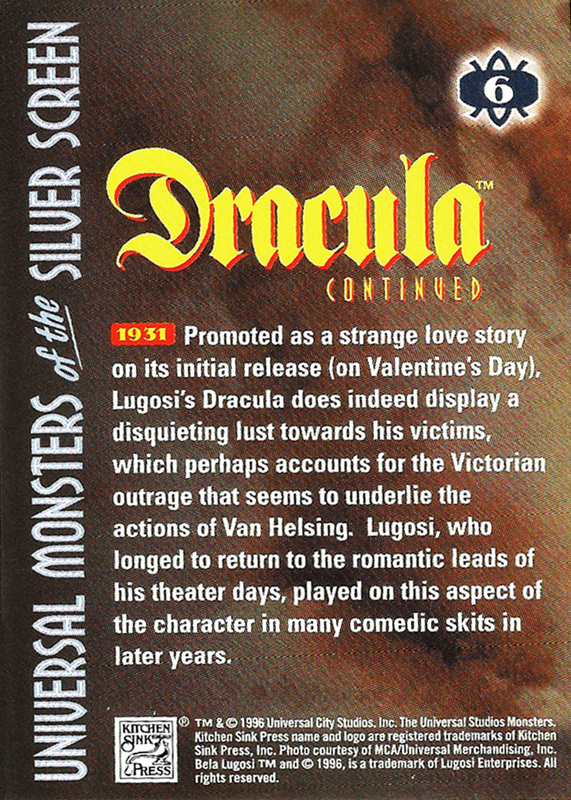 I’ll also post some images of the box artwork for the collection (click here). 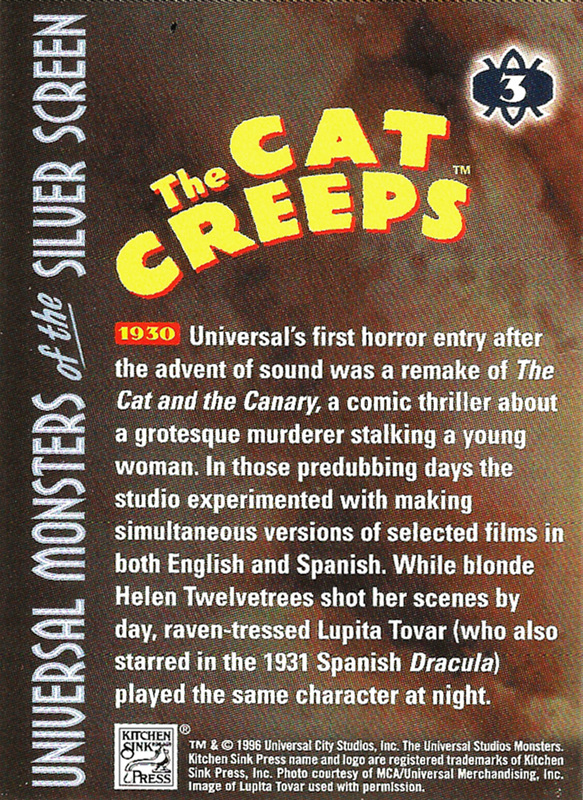 To get the ball rolling here are cards #1-15, both front and back.